Rahm Emanuel raked in $320,000 from a stint at Freddie Mac that required little to no actual work, the Chicago Tribune reported. Top White House staffer Rahm Emanuel banked over $300,000 from a brief stint at fallen mortgage giant Freddie Mac - a paycheck he earned from doing little to no actual work as the firm tanked, the Chicago Tribune reported. President Barack Obama's chief of staff raked in about $320,000 during his 14 months spent at Freddie Mac, overseeing the lender as it misled shareholders about outsize profits, essentially cooking the books to convince investors of potential earnings. 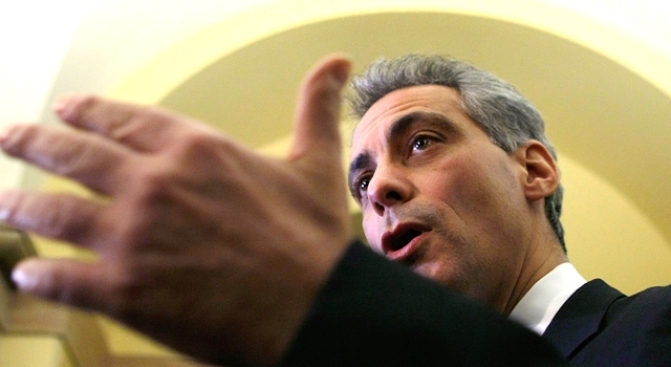 Emanuel's involvement with the firm has been widely reported. The newest development is how little work he put in to bank the big bucks he earned on the job. The Freddie Mac board did most of its work in committees - but reports show that none of the committee assignments went to Emanuel during his 2000-2001 tenure, according to an interview with Armando Falcon Jr., head of a federal oversight agency for Freddie Mac. Most of the other directors on the board got at least two assignments each, proxy reports show. Emanuel's main task as part of the board was to help others figure out how to delegate responsibility, fellow director and former Illinois Attorney General Neil Hartigan said. Hartigan said Emanuel was not "outspoken," but "solid" when he showed up for meetings. Emanuel also worked with Freddie Mac when the company began to crumble after its CEO, Leland Brendsel, was pushed out in 2003. Obama's top aide was part of the Financial Services Committee, which held hearings to attempt to fix the firm. According to Congressional records, he skipped every hearing. He didn't show to avoid "the appearance of favorism, impropriety or a conflict of interest," Emanuel's spokesman Sarah Feinberg said.